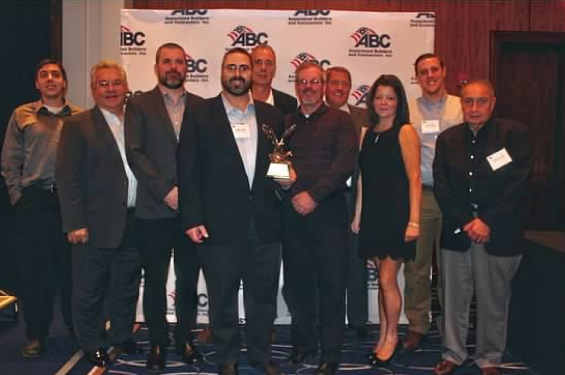 On October 29th, Esposito’s Electric was the recipient of a prestigious Eagle Award for Excellence in Construction during the Associated Builders and Contractors of New Jersey’s annual ‘Excellence in Construction Awards’ Presentation in New Brunswick. Esposito’s received the award for its work on an extensive service replacement project for a nearly 500,000 square-foot tenant-lease facility in Randolph owned by Rubenstein Properties/Beta Realty Group, LLC. According to Patrick Stewart, President of ABC-NJ, “our program showcases the hardworking and dedicated members of ABC-NJ for their outstanding abilities in construction and development,” and is designed to create greater awareness of the quantity and quality of work being produced by ABC-NJ members as well as to continually raise standards throughout the construction industry. One of 12 elite projects to receive an Eagle Award, the award recognized the work performed by Esposito’s Electric on the ‘Beta Realty Service Replacement’ as being among the ‘Best of the Best in the Construction Industry’ by ABC. “We’ve been members of ABC-NJ for a long time, but this was the first year we ever submitted a project for consideration in their Excellence in Construction contest,” shared Esposito’s Electric Project Manager Albert Joseph of the project, which took over six months and involved the replacement of a dated electrical service, the installation of separate metering, and a major distribution system overhaul while ensuring no disruption to operations for the facility’s 14 tenants. Representing Esposito’s Electric at the awards ceremony were team members Albert Joseph, Craig Jones (Sales Manager), BJ Travers (Project Foreman), Mike Hubley (Journeyman Electrician), and Nicole McGuigan (Job Administrator); the team was also supported by Rey Mercado (Director of Operations), Rodger Marshal (Site Manager), and Mark Bobb (Project Manager) from customer Beta Realty Group as well as by engineers Rick Gerrity and Todd Miller from Pennsylvania-based Smith Miller & Associates.